She was incessantly talking again and I couldn’t quite make it out. It was a weird mixture of howling and yelping and we’d heard a similar sound earlier in the trail but had no idea what it was. We kept walking. Craig and Kalyra were no match for my long legs and had fallen behind. Savannah always wanting to be by my side manages to keep up. “Caaaaaz” a frantic roar from Craig. “I don’t think that was coyotes,” I yelled at her as we turned and bolted. He called a couple more times not hearing my return screams to say “I’m cooooooming”. I begged my legs to go faster as a million scenarios ran through my mind of what was wrong. We rounded a corner and I saw Kalyra standing frozen solid a look of fear and pain on her face. Craig was bending over her, trying to get something out of his bag and telling her it will be alright. Time moved into slow motion that split second as my brain processed this as the worst situation the signs throughout the Saguaro National Park had warned us about. Oh My God. She’s been bitten by a rattlesnake. In those split seconds, I wanted to vomit, cry, scream and launch into Mumma Bear savior mode. My next few steps moved around Craig and revealed a large oval shaped green spiky beast attached to her leg. Some unidentified killer from the desert was embedded into my daughters leg. And far in they were. I gripped her hand tightly while asking Google if cactus were poisonous and Craig plucked them out with the leverage of his keys transferring the needles of the beast into his thumbs. I refused to participate in the game of pass the jumping cholla – yes, the real name of the green beast because that’s what they do! He managed to pull it out of his hand with the keys and we could all breathe gain. “Oh my goodness. I’m so glad it was a cactus and not a rattlesnake Kalyra.” I hugged Kalyra her tight. 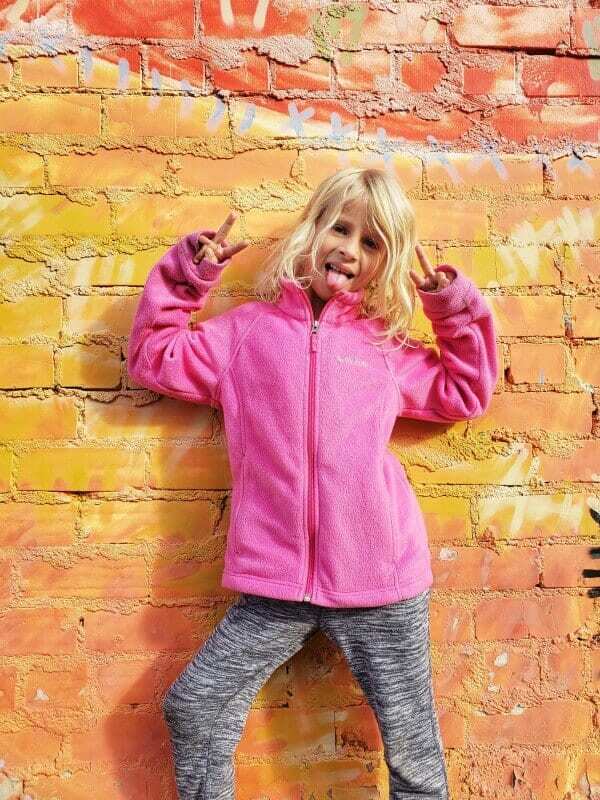 I then thought it was a safe time to erupt into giggles and tell her that Savannah and I were curiously listening to her howls thinking it was coyotes in the distance. Mother of the Year strikes again! I have no idea what a coyote sounds like!! We googled that one on the car ride home and my suspicions were correct. They definitely sound like they’ve got a jumping cholla embedded in their legs. “What a great strategy to get out of the walk Kalyra.” I said as we walked back down arm in arm. She’d be complaining for most of our 3.4 mile return hike and, now with the trauma of the desert attack, we chose to turn back and head for a calmer sunset experience. In those split sections, when my worst fears were a reality, I was woken up to the brevity of life. It can be taken from us, and those we love, at any moment and in any way. Not long after this happened, I received the tragic news of an Australian blogging friend of mine whose husband was taken from her in a tragic accident. Life is more fleeting and precious than we realise. I cuddled my girls on the way back down, grateful we were making our moments count together. Of course, at 2am that morning, I sat bolt upright in bed sweating with fear over our dangerous lifestyle. I lay awake for hours listing all the ways my daughters were exposed to death and creating a fool proof plan for each of them. Live each day with fullness, presence and joy, or live in a black box away from the dangers and never come out. I guess you know what we’re doing. We’re going to go live with the rattlesnakes, coyotes and jumping chollas and make our lives stories to tell!! SEND THEM MY WAY NOW! 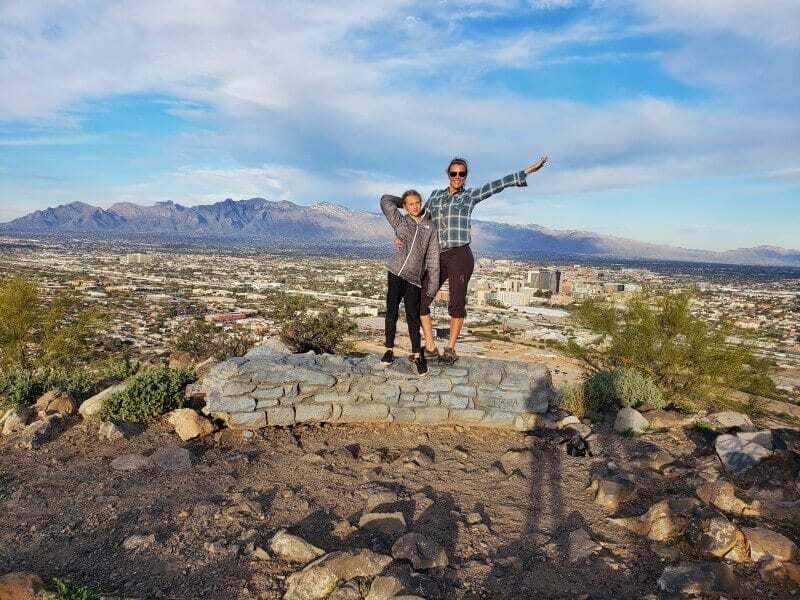 This week 7 wrap up of our USA road trip shares our adventures from Saturday to Friday. The below travel costs are also from that time period. Be sure to follow us on Instagram and Facebook where we share the current day to day adventures. So that was the adventures of week 7 on this RV road trip across the USA! 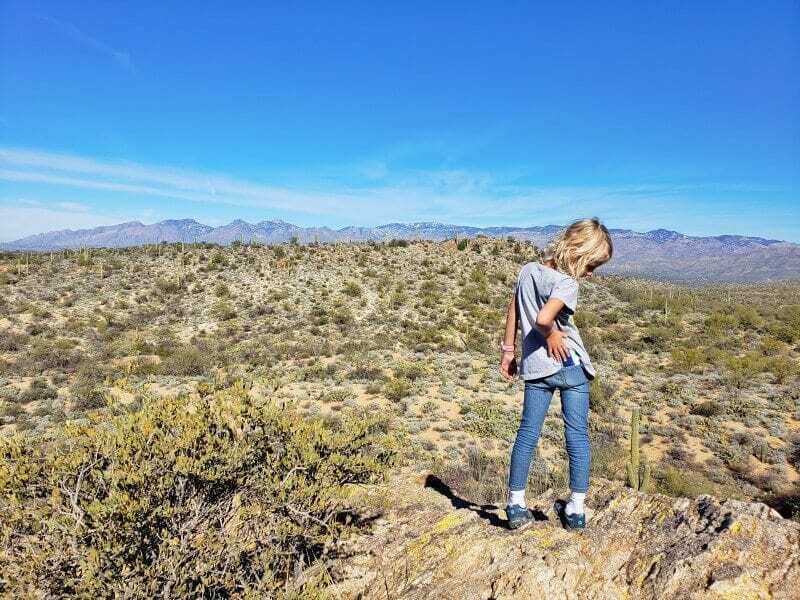 That was the fun of exploring Saguaro National Park, which is a fantastic national park to visit, both the east and west side. Although I preferred the east. It’s small and the trails are easy. 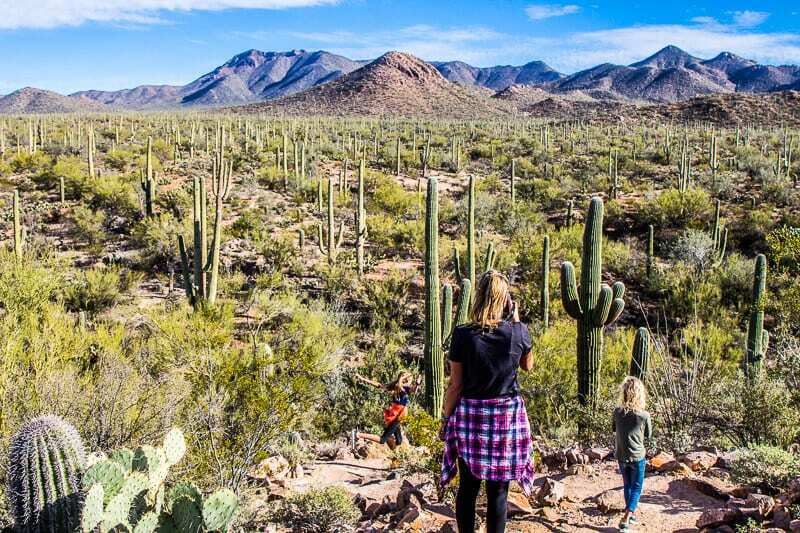 We’ll have a more in-depth post on what to do in this national park and Tucson soon. Needless to say we learned a lot about desert flora and fauna! 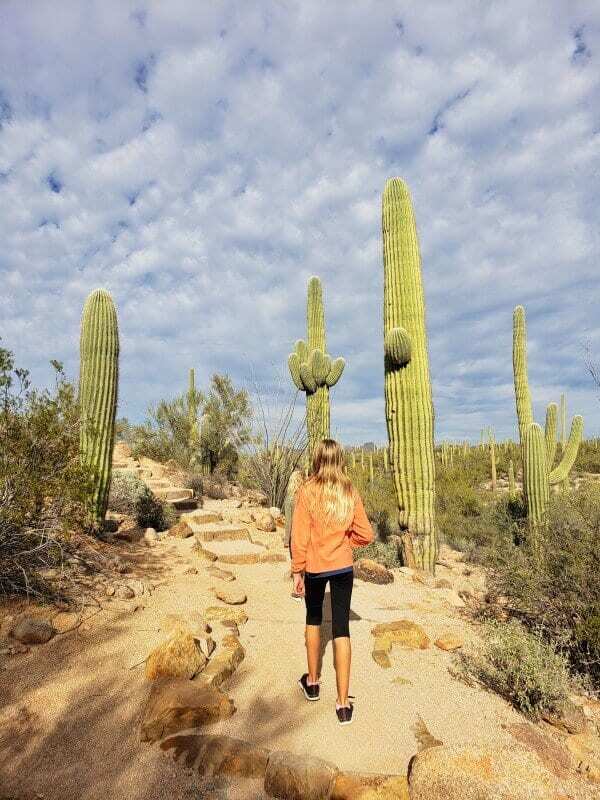 And those beautiful saguaros. 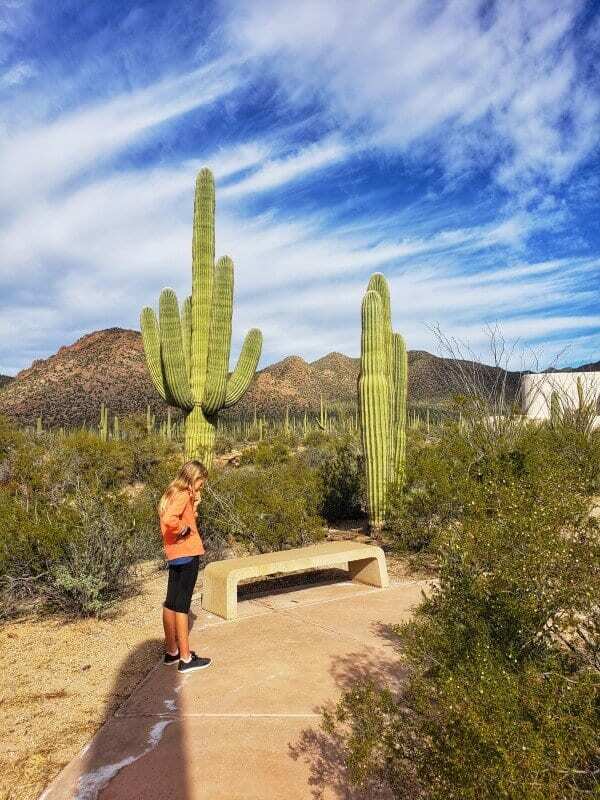 We decided to skip the Arizona Sonora Desert Museum, which many people recommended to us. We didn’t see the point of going to a desert museum in the middle of the desert. Why not just go out and explore it on your own and learn through real life interaction? 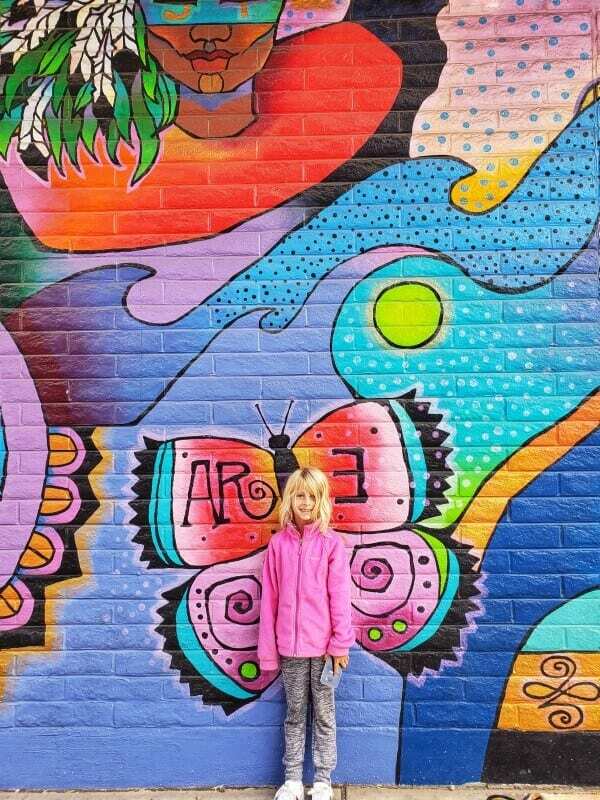 We didn’t do too much in Downtown Tucson, except find a couple of cool murals. I think the area is more about the surrounding natural beauty. 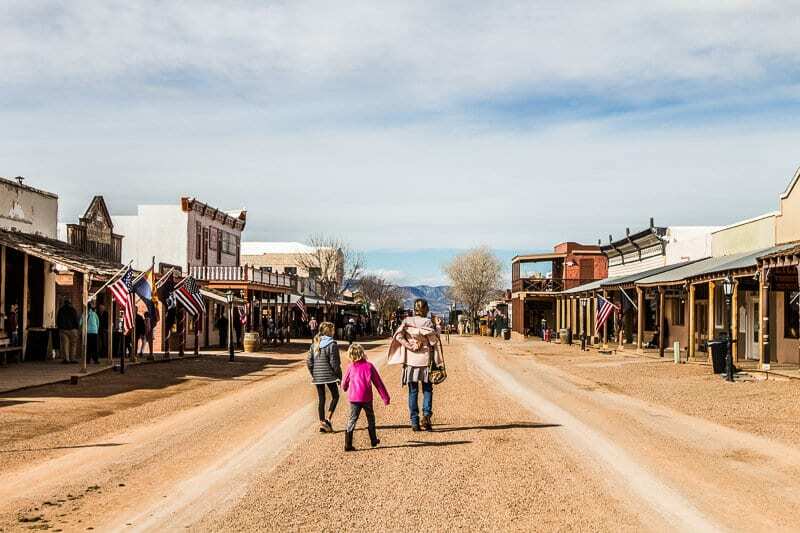 We also had fun exploring the Old Wild West town of Tombstone, still left like it was in the debauchery years of the 1800s where prostitution, gambling, gun fighting, and drinking was common in this silver mining town. 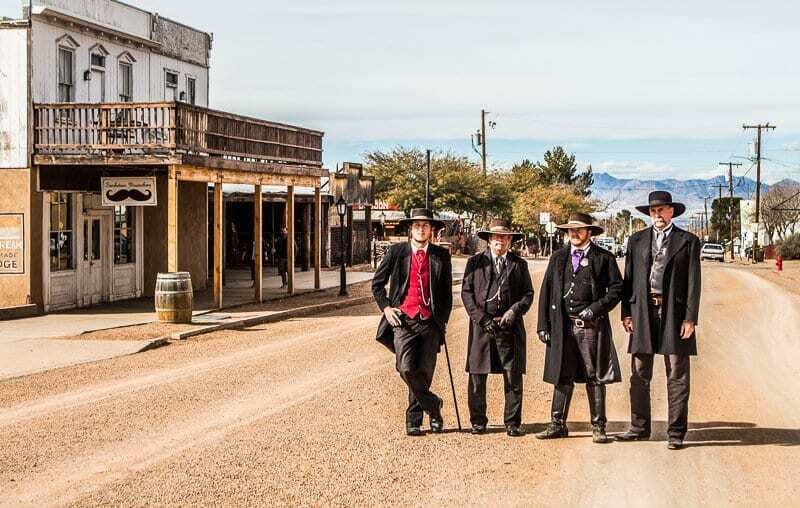 We want to find those quirky US experience son this America Unplugged road trip, and Tombstone fits that bill. and admiring some stunning views from Sentinel Peak, or A Mountain as the locals call it. 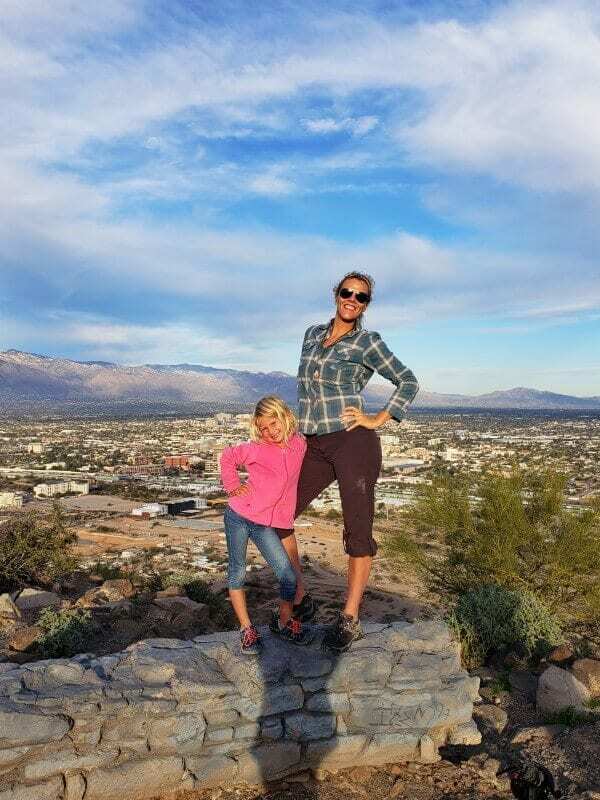 We wanted to go up to Mount Lemmon as it was recommended to us many times, but we were short on time, so headed up to A mountain instead. It was really worth doing. 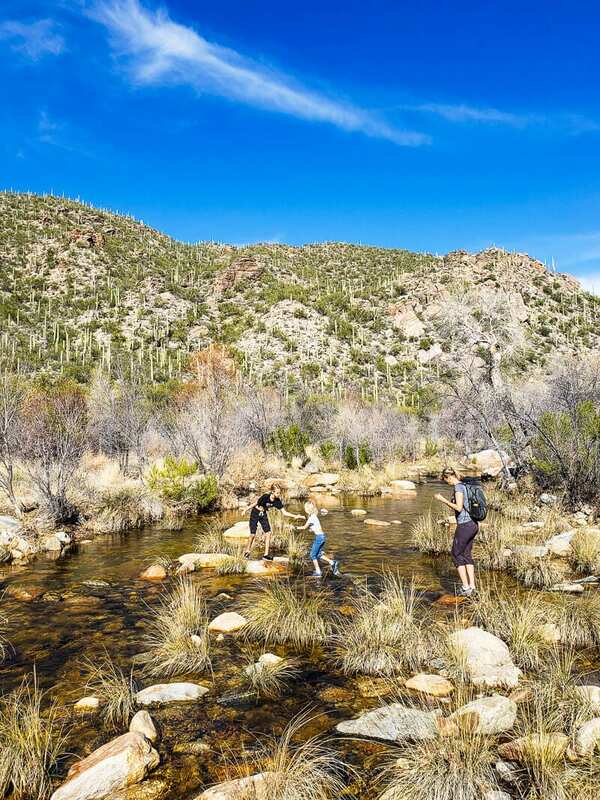 It’s an easy drive up to the top followed by a short hike and divine views over Tucson and the surrounding mountains. The girls were teaching me how to get my Insta pose on. Our last day for this week was spent in a hurry packing up Goldie expectantly and trying to find a place to stay. We thought we were checking out a day later than we were. We planned to have a rest day catching up on work and planning our next steps until there was a knock on our door asking when we were leaving!! Our hearts just aren’t into big sprawling cities at the moment. The wilderness has seeped into our blood and that is all I want to experience. We were going to stay in Phoenix for a week but decided against it. It was a challenge, as speaking of urban sprawl, I’m headed to New York this coming week for a travel industry event, so I’m flying in and out of Phoenix. I really don’t want to be wasting time on this trip staying in places just for the sake of staying in them. So about 30 minutes out of Phoenix we rerouted the Navman to Sedona. Sedona been at the top of my bucket list for years. Craig and the girls went last year with his family and loved it. It means driving back to Phoenix for my flight but it’s only 2 hours. It’s worth getting to spend the time amongst the red rocks rather than a dodgy RV park in a concrete jungle. Oh, we nearly didn’t find a RV park either. We had no idea it was Martin Luther King JR weekend which meant a public holiday and all the campsites were full. We were so lucky to find one about 20 minutes out of Sedona. 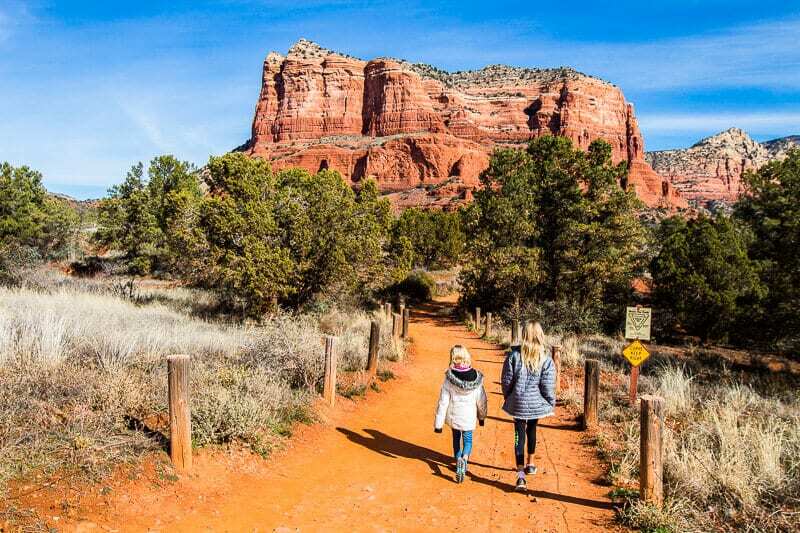 We’re here for the week and will then hopefully move to the campsite in the center of uptown Sedona. Water is an issue!! We go through it way too quickly. We’re highly aware of it this week as we are disconnected from the mains and living off our water tanks. We only lasted three days before filling it up again. To preserve water, we aren’t showering every day – every second and they are super quick. a week without washing your hair. Could you handle it? Welcome to RV life. The biggest drain on our water is washing up. So busy figuring a solution for that. Please leave any tips!! Luckily there is a faucet near our camper we can stretch our hose across to top up. Without that, we’d be in trouble. Our black tank fills quickly. Once that fills, we can’t use our toilet anymore, if we don’t have sewer attachments at our campground. We currently don’t. Thankfully there are restrooms here, so we’re dashing across to use them during all light time hours. Flashback to the good ole days. I’ve had this conversation a few times lately with female friends of mine, and we all agree, going to public campground restrooms of a night time (And sometimes the day) is quite an unnerving experience. Probably something men don’t often feel or understand. A trip to Camping World was necessary to pick up a portable sewer and wastewater disposal unit! 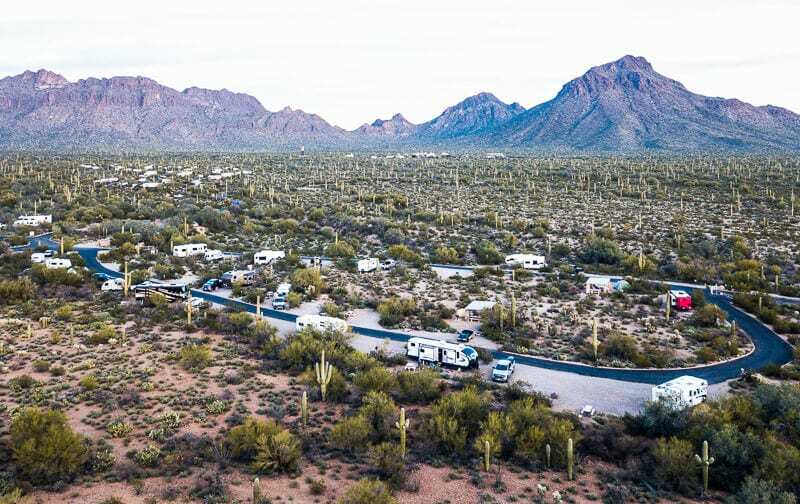 It’s difficult to find RV parks in Phoenix. So many of them are just for the 55+ age group. 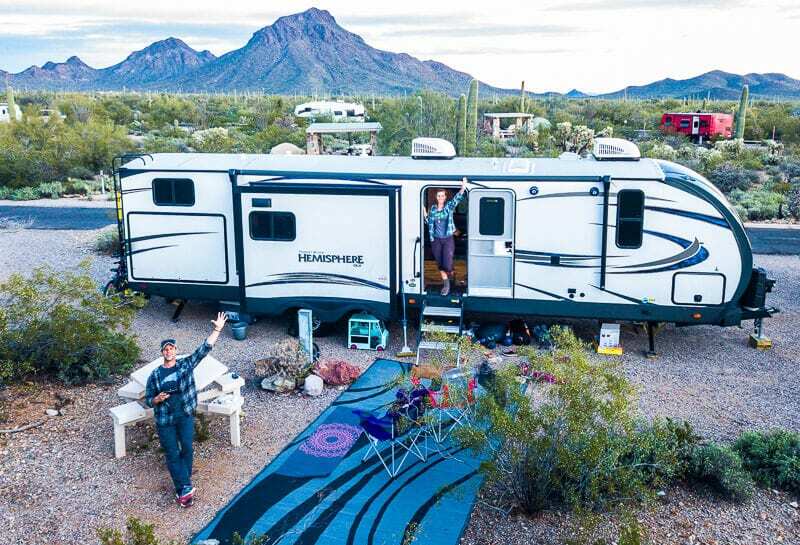 It’s not just grey nomads and snowbirds living the RV lifestyle now. Most of the reviews aren’t good and the parks are expensive. 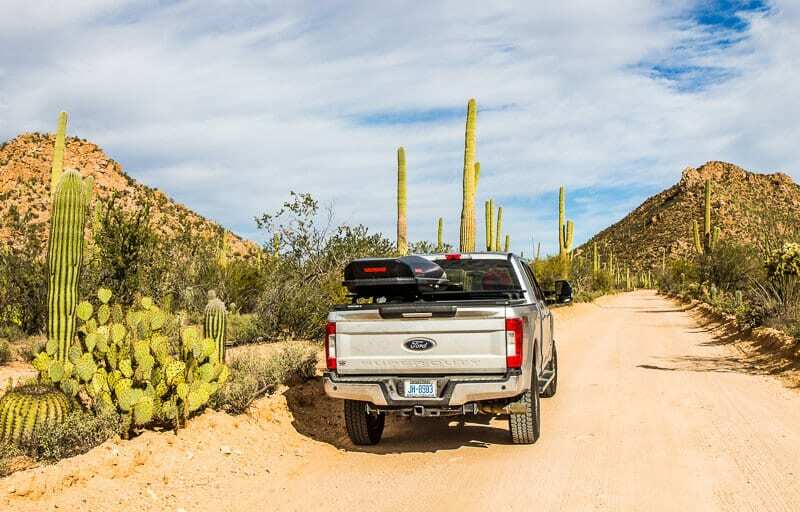 We finished out our week at the Gilbert Ray Campground in the Tucson Mountains. We loved this campsite. It was so serene and beautiful in the middle of the wilderness. Our site was huge and very secluded. And what a bargain for only $20 a night. It was a bit rough not having showers and limited water supply. But at least it teaches you about water conservation and how much you can waste! 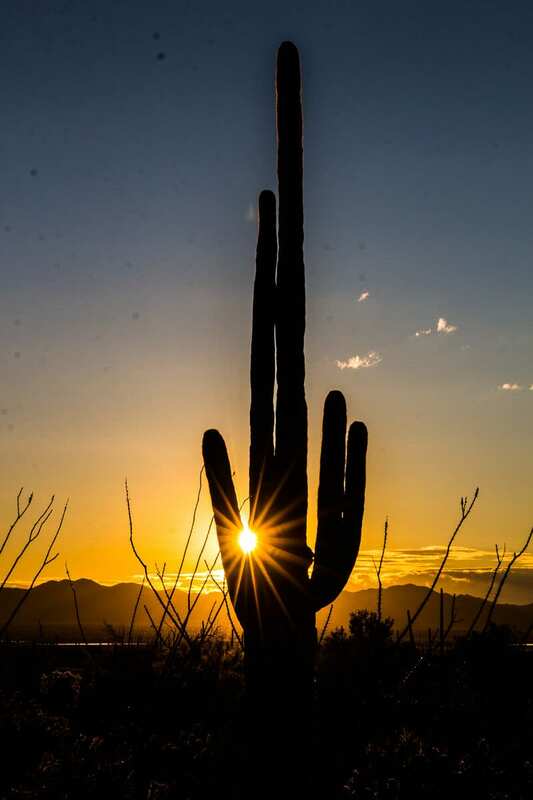 For those who are looking for Tucson hotels or apartments, check out the options in Hill Country through our partner, Booking.com. You can also check out Airbnb options. We came in at budget this week. Stocking up at Costco and RV supplies made our expenses more than usual. Leave room in your budget for RV supplies as something is always going wrong!! HOWEVER, there’s no one taking money anyway because of the shutdown. So sad for the National Parks and all the money they are losing, not to mention all the workers not getting paid!! We eat a mostly whole foods, organic diet, which means our grocery bills are higher than what would be typical. Don’t forget with eating out costs, tip will be included in the prices below. We’re in Sedona until I get back from New York and then a few days extra. There is just too much I want to do here and there is not enough time to fit it in before I leave for New York. There is nothing wrong with extending your stay in a place you discover you love. I am excited about it. It’s a great event, and well, New York. But it’s a dragging me there excitement as I don’t want to leave the beauty of the south west, its serenity and our warm weather. Stay tuned to see what happens! Videos of the trip coming out soon. We’re very behind! Subscribe to our channel so you don’t miss it. We’re now releasing our road trip videos. You can find our previous months posts here. 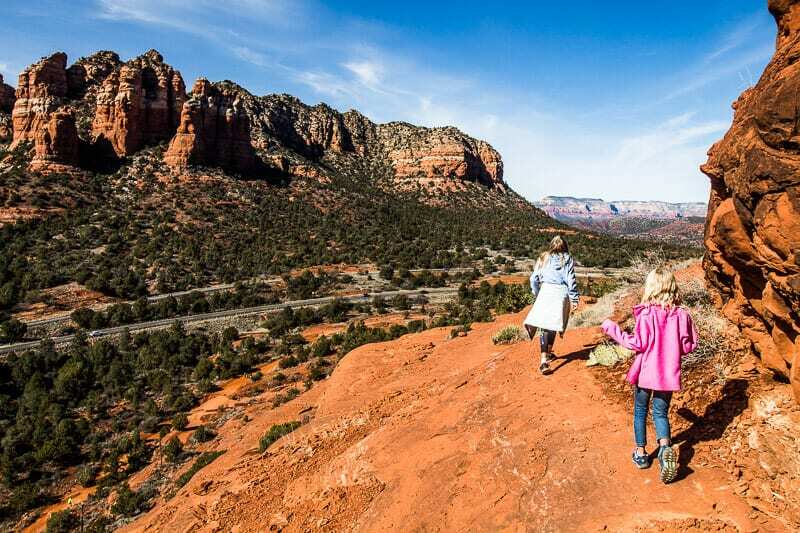 Have you been to Sedona before? Share your tips. Do you have constant RV troubles too?